Paper craft is given a stunning and contemporary look through these easy-to-make projects for home décor. Transform a simple sheet of paper into something extraordinary! Explore the versatility, beauty, and simplicity of paper. From a geometric paper-folded vase to paper petal lights and a unique paper cuckoo clock, you’ll discover 25 projects that use basic materials and easy techniques to create stunning home décor items. 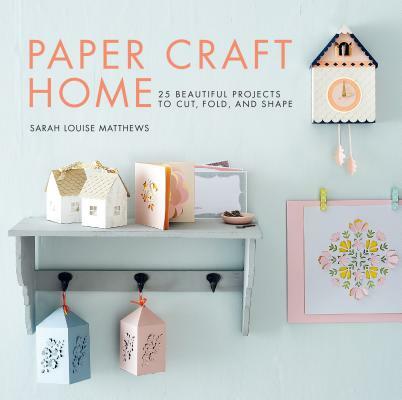 Taking inspiration from the shapes and repetition found in architecture and nature, designer and paper-lover Sarah Louise Matthews offers contemporary designs that will add a creative flair to your home or make for wonderful gifts. With clear step-by-step instructions and beautiful photographs, you’ll explore techniques like paper cutting, folding, and engineering to create gorgeous results. Sarah Louise Matthews is a UK-based paper crafter and paper-cut product designer. With a degree in textile surface design, she has worked with various brands to create all manner of bespoke paper objects for photo shoots, visual merchandising, and events. She also designs and makes her own range of paper-cut stationery, decorations, and artwork, which she sells online. Her work has appeared in print and online in magazines including Mollie Makes and Uppercase.